Helvetimart is a specialty market in Lausanne offering a wide variety of regional food products and high-quality Swiss groceries sourced from across the country. The identity had to express this broad range through a culturally interesting experience. Mexican graphic design studio Anagrama, created a brand identity that is heavily inspired by regional flags and antique architecture, through a strong favour for colour and form language. The studio designed a visual system that touches upon the regionality of its products and historic signatures. These regional flags, from each of Switzerland’s 26 sovereign states, were simplified to create a homogeneous language, using representative elements, grids and colours to allow for the distinction across the different market sections. The naming for the store is inspired by the term “Helvetia”, the national personification of Switzerland. Helvetimart’s cornucopia icon, is a symbol for the abundance of the wide variety of products available in the market. The Swiss culture’s folklore and antique architecture served as inspiration for the clean and geometric patterns. 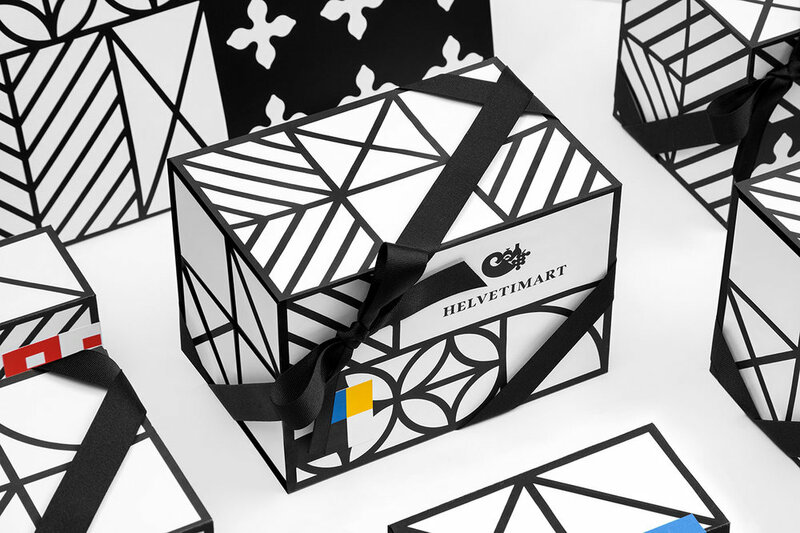 These patterns address a very modern expression from heritage references and work as Helvetimart’s iconic graphic resources used throughout the brand’s packaging, signage and other applications, achieving the unity of the brand and visual impact. The studio designed a visual system that touches upon the regionality of its products and historic signatures. The Swiss culture’s folklore and antique architecture served as inspiration for the clean and geometric patterns. Anagrama is a Mexican studio specialised in Branding and Visual Identity. It is represented in Monterrey, US and Tokyo. Anagrama's work has been featured in many design magazines around the world and the studio is frequently part of the judge panel for various international design competitions.